Actually, you could think that if your vehicle doesn’t have much damage after a motor vehicle crash that you may have slipped by without any injuries. This is a common misconception by many and results in long term pain and problems due to untreated injuries that present themselves later in time. Think about this. For example you punch into an object, let’s say a wall. Think of how your hand, arm, shoulder and neck will feel if you hit the wall that has a 2×4 where you punched it. All that force goes back into your body, causing injury into your hand, arm, shoulder and neck. It would be so much better if that wall gives in and crumbles, taking the forces away from your body. As the wall gives way, the forces of the punch spread as the wall crumples and not back into your hand, arm, shoulder and neck thus avoiding injuries to those parts of your body. Now let’s consider you are a driver of a car that gets hit in the rear but the accident doesn’t cause much damage to your vehicle. The force of that rear-end collision now has gone to you as the occupant instead of the metal bending and absorbing the forces. Just as the wall that did not give way, the forces of impact now go to you as the passenger, causing sprain/strain and injuries quite often to the neck and lower back. The Fakhoury Medical and Chiropractic Center is experienced in treating auto accident injuries for over 30 years and we do not take fender bender injuries lightly. These patients get evaluated just as thoroughly as individuals with high property damage to their cars. As mentioned, a minor impact can cause significant injuries to the spine and occupant, especially when the car does not crumple and give in. 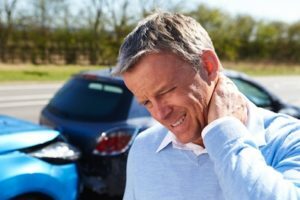 If you or someone you know has been in an automobile accident, please be sure to follow up with an evaluation to determine if there are any injuries that need to be treated. The Fakhoury Medical and Chiropractic Center has same day appointments for evaluation and treatment of car accident victims. Remember, left untreated, injuries from these minor impact accidents quite often result in future neck pain, headaches and back pain. For further information or to book and appointment, please go to bestinjurycare.com, or head2toecare.com.